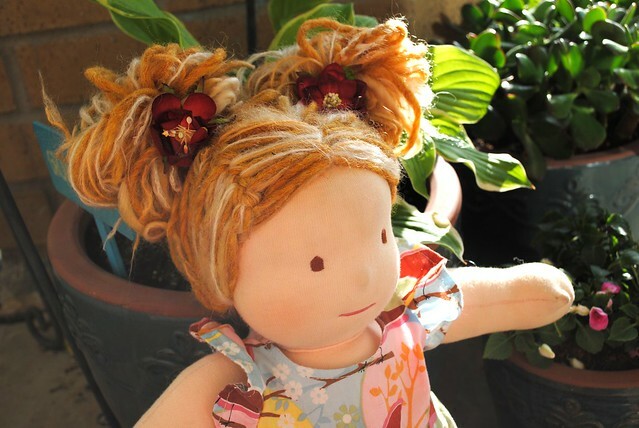 Maggie likes to have me do her dolly’s hair, and is forever requesting more and more complex styles, far above the usual pony tails and simple braids. 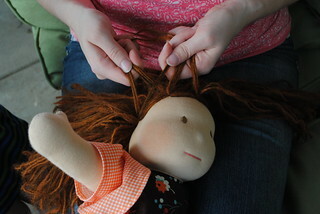 I don’t mind this because I actually find doing doll hair really relaxing, which might be kind of weird, but what can you do? 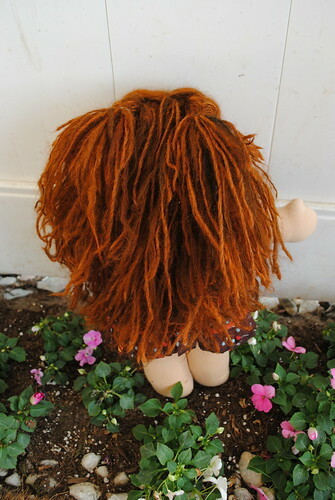 I also like to keep her dolls’ hair styled because dolls with crazy, free flowing locks usually turn into dolls with nasty, matted, broken, snarl bombs that take forever to de-tangle and de-crud. I fix Maggie’s bum length blonde hair for the exact same reason. 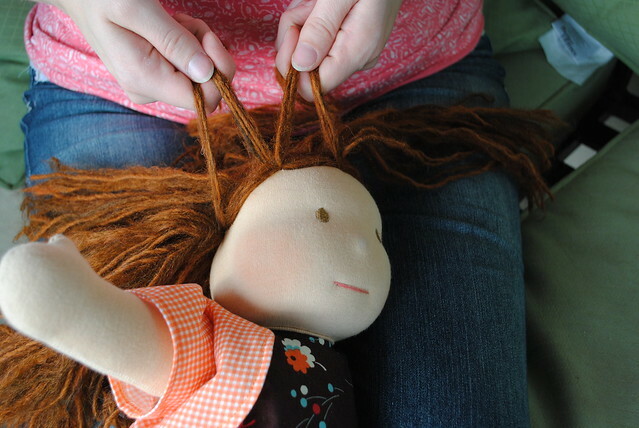 Doll hair is different from people hair in that is typically doesn’t come straight out of the scalp, but is often sewn in in layers, and that can make it challenging to translate your usual hair-dos, because when you pull hair from one area, it exposes the “scalp”. 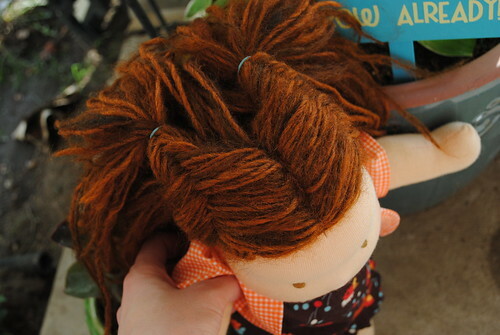 It can look particularly weird on dolls with yarn locks, like this pretty Bamboletta. I’ve sat down and figured out a few ways to make some fun styles work, and I figured, what the heck- my blog readers are used to me being totally random-so I’ll just do a post or three on some of these styles I’ve worked up while doing my mothering duty. I’m going to start with this fishtail braid, because it is quite simple, but looks neat enough to make people wonder how you did it. I do Maggie’s hair like this from time to time. The main trick is to take just a very small amount of hair from the back each time. I would love to see how this looks on a doll with rainbow tresses! 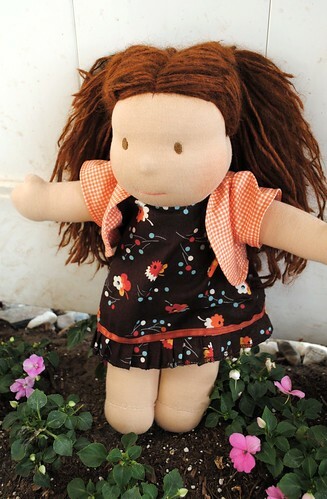 Start by getting a firm grip on your doll. My chubby thighs work great for this. 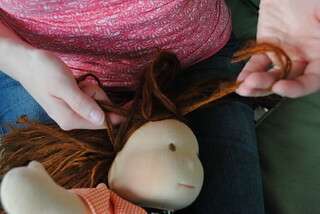 Then part your doll’s hair down the center using your fingers, and work with just one section at a time. You can see how the yarn is stitched in there in layers that you don’t really want to have showing. There is a layer dead center of the forehead, at the “ear” and one right in the middle. On a people-style fishtail braid, you would grab a huge section of hair, divide it all into two and go to town, on this, you need to be a little more strategic, and start off with a bit of a french braid style fishtail. 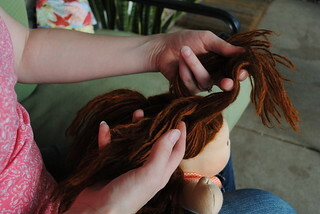 Take a small amount of hair on each side, and divide the center into two equal parts, as shown above. At this point, you want to grab a very small amount of hair from one side (2-3 strands of yarn) and cross it over to the other hand. Then do it again but from the other side. Don’t worry if this looks odd now, it takes a few repetitions to make this start looking like a braid. Keep taking just a little hair from one side and crossing it over into your other hand, left hair to right hand, right hair to left hand. Your hands will slowly have more hair in them with each repetition. It won’t take too long before you see the fishtail pattern, and all the seams are hidden under the pretty braid. You can decide now if you want to fishtail all the way to the ends, or if you just want to stylishly pull the front back. I like to just do the front. 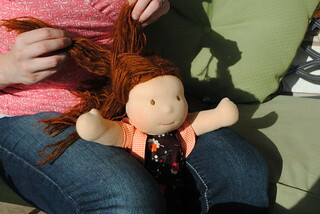 Once you get a good start, you will realize that you are holding two very large hunks of hair, and that there isn’t much to cover the seams in the back, on top of which, your braids are getting a little chunky and slightly out of control. Just reach underneath (while keeping the strands separated) and gently pull the bottom half of the hair away from the braid, as shown. This will make her hair much fuller looking, and cover seam lines. Doesn’t she look pretty? Nice and full in the back, but spunky and ready for action in the front! Up next- french braided messy buns- or as we like to call it, “Flower Girl Hair”.